A major cause of survey drop out is respondent fatigue. The survey just takes too long. Every extra action counts. — against you. That’s why Pinnion gives you the opportunity to do away with the submit button. Two new options give your respondents the ability to tap once, or twice, on their answer to submit their response and move to the next question. you can take the survey embedded below which shows both options. The first set of questions allow you to tap to select, then tap again to confirm — and move you to the next question. The second set of questions features just a simple tap to select, submit and move to the next question. Your choice. Your respondent’s delight. And think of all those extra completes you’ll get. This survey also features the ability to see the order in which respondents choose from a list. After each choice, they’re presented with the remaining choices. It’s just that simple. Instant tap to confirm: When the respondent clicks an answer, their response is immediately recorded and they are moved to the next question. 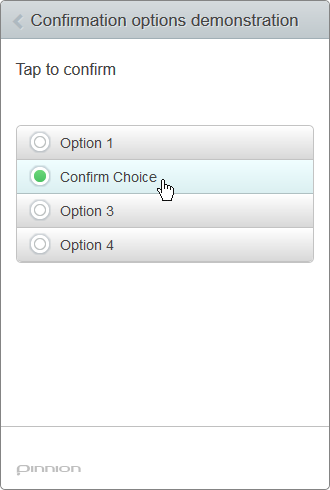 This option gives respondents a chance to modify their choice prior to confirmation before advancing to the next question. 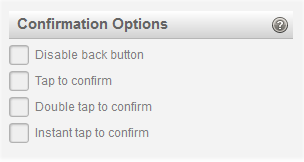 Finally, the back button can be disabled on a per-question basis. This can be done with any or none of the tap options above. This is ideal for cases when you don’t want respondents to back up and change their answers–especially useful when skip logic or prerequisites are in use.